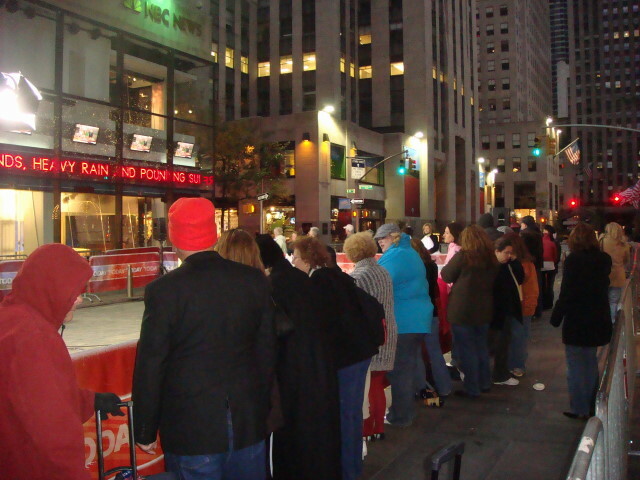 When I was at Rockefeller Center for the Olympic Men’s Marathon Trials, I decided to stop by the Today Show in case they were broadcasting from outside. They weren’t. I’ve never understood their process for organizing the crowd but that’s probably because I keep coming to it from the wrong direction (that is, from the north). They have a double lined fenced in area with the entrance at the far south. That means you have to go around the outer fence to enter and then go around the inner fence to get to a decent viewing area. Here’s what it looks like when there’s no one out broadcasting and there’s no sign that they ever will for who knows how long. The did have the TV on and decent audio being broadcast to the crowd. They did do something that I thought was really nice. When the commercials came on, they muted the sound. I like little things like that. The traditional Today kind of viewers were there. That is, sign carriers. Actually, I was one of the very few there without a sign. I only stayed about five minutes, though. And never saw a sign of the actual broadcasters. I’m sure they eventually came out. 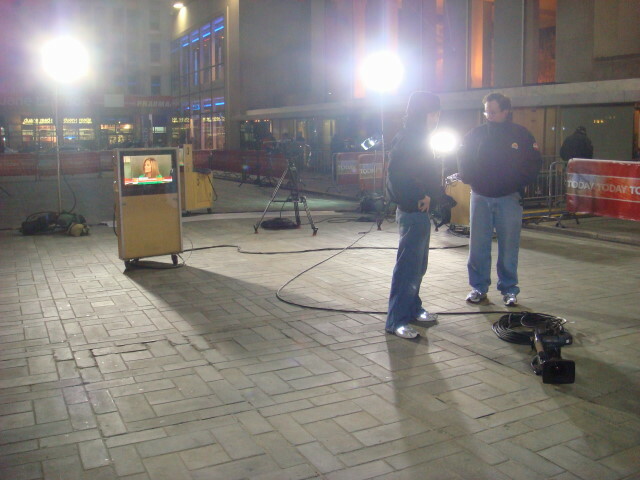 The one other time I was at the area for the show was when they were doing an outdoor broadcast and I barely missed it (they finished their talk and went inside in the same time it took to get through their crowd control fencing). Someday I may actually make it there. This entry was posted on November 10, 2007 at 8:47 pm and is filed under Celebrity Points, Manhattan, Mid-town. You can subscribe via RSS 2.0 feed to this post's comments. You can comment below, or link to this permanent URL from your own site.